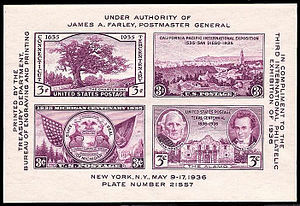 The stamps on the sheet may be perforated in the usual way, or imperforate. The margins or selvage of the sheet may have additional printing, ranging from a simple statement of the occasion being commemorated, up to a full picture of which the stamp(s) are just a small part. The margins of the sheet may have ornamental designs, price, emblems and logo(s) which are not the part of stamp(s). Stamps on the miniature sheet can be in se-tenant position while the same stamps were not se-tenants in regular issue. Both the stamps and the entire sheet are valid for mailing, although they are almost always sold above face value and kept in mint collection by collectors; a handful of usages may be found as philatelic covers. Luxembourg issued the first generally recognized souvenir sheet in 1923, a single 10-franc stamp, not otherwise available, inset in a larger blank sheet. The purpose was to honor the birth of Princess Elisabeth. However, this country had produced a somewhat similar issue in 1921, a small sheet of 5 stamps to celebrate the birth of Prince Jean, and an even earlier sheet of 10 stamps for the accession of William IV in 1906. Neither had margin inscriptions and both consisted of regular issue stamps that were otherwise available. Since the 1920s many other countries have produced souvenir sheets. The United States issued its first one in 1926, and printed several more in the 1930s, with new ones occasionally issued since that time. Starting in 1955 the United Nations has occasionally produced them. While some of the earliest souvenir sheets are valuable (for instance in excellent condition the US White Plains sheet of 1926 is worth hundreds of dollars), modern ones are typically produced in considerable quantities and have no special value. A miniature sheet from the Faroe Islands, in which the stamps form a part of the larger image. A miniature sheet from France, in which each stamp is featured twice, once in the main picture and once at the bottom in a more traditional display. Celebrate the Century souvenir sheet issued by the United States. Fifteen stamps are depicted with perforations running to the edge of the sheetlet. The British miniature sheet for the London 2010 Festival of Stamps. Wikimedia Commons has media related to Miniature sheet. Field, David. David Field All-World Miniature Sheet Catalogue. London: David Field Holdings, 1973 ISBN 0-903635-00-3, 232p. Sieger-Spezial-Katalog Europäische Blocks. Lorch/Württemberg: Sieger, 1992 480p.